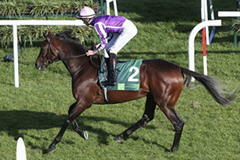 Aidan O'Brien completely dominated the race, taking the first three places with Kew Gardens, Southern France and Nelson. It was the Irish trainer's 62nd Royal Ascot winner, his sixth victory in the Queen's Vase and his first success of the 2018 Royal Meeting. Kew Gardens, a son of Galileo, won easily by four and a half lengths at 100/30. He was ridden by Ryan Moore, for whom it was a 49th Royal Meeting triumph. O'Brien said: "We always thought Kew Gardens would stay, and he loves fast ground. We were very happy with him all the time and, even though he was a bit disappointing in Epsom [he was ninth of 12 in the Derby], we have been very happy with him since then. "Donnacha [O'Brien's younger son, a jockey] thought after riding him in Epsom that maybe we rode him too forward and that taking your time on him a bit more would suit him. Ryan did that today and it worked out lovely. "I am delighted with the other two. It was Nelson's first run back for a long time while Southern France is still a big baby who is going to improve a lot as the year goes on. We thought all three would stay beyond a mile and a half - that's what they are bred to do, really. "Kew Gardens can do a lot things. He can go back for the Irish Derby or have a little rest and be trained for the St Leger. The St Leger is a long way away but in the autumn it would be a lovely race for him. But he came out of Epsom very well and if he comes out of this as well, he could well go for the Irish Derby; it's always a race we consider with these horses. We'll see how he is." run at two miles from 1977 to 2016.